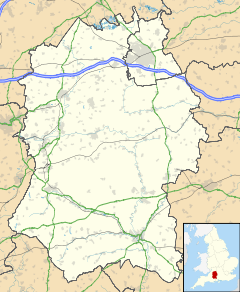 South Marston is a village and civil parish in the Borough of Swindon, Wiltshire, England. The village is about 3 miles (5 km) north-east of Swindon. The earliest documentary evidence for continuous settlement in the parish is from the 13th century, but there is fragmentary evidence for occupation as far back as the Bronze Age. It is claimed that there were Roman remains just outside South Marston in a field belonging to Rowborough Farm, but these have long disappeared. Ermin Way, a major Roman road linking Silchester and Gloucester, ran close to the south-west side of the village, separating it from Stratton St Margaret. There was a Roman station at Durocornovium (now Covingham), one mile south of the village. The name "Marston" derives from a common Old English toponym meaning "marsh farm". This suggests the village was founded before the Norman conquest of England in 1066, but it is not recorded in the Domesday Book (1086). Documentary evidence exists from about 1280, when the village is mentioned as part of Highworth Hundred. South Marston became a civil parish in 1894. For church purposes, South Marston was a chapelry of Highworth until it was made a separate parish in 1889. Early in the Second World War, a Ministry of Aircraft Production shadow factory and airfield were built for Phillips & Powis Aircraft Ltd, and 1,090 Miles Master training aircraft were built there. Short Brothers Ltd also used another part of the airfield for final assembly and testing of locally-built Short Stirling bombers. Vickers-Armstrongs-Supermarine acquired the site later in the war and produced Supermarine aircraft including Spitfire, Seafire, Attacker, Swift and Scimitar there until the early 1960s. In 1985, Honda bought and closed the airfield and reassigned it to car manufacture. The principal book storage facility for Oxford's Bodleian Libraries has been located on South Marston Industrial Estate since 2010. Alfred Williams, poet and steam-hammer operator at Swindon Railway Works, died in South Marston on 10 April 1930 aged 52. A large residential development was built on the site of the Manor House in the mid-1980s. This article summarises the history section of the village web site, which is a referenced resource for research on the village's history. ^ "Wiltshire Community History - Census". Wiltshire Council. Retrieved 27 January 2016. ^ "South Marston Ch/CP through time". A Vision of Britain through Time. University of Portsmouth. Retrieved 11 March 2018. ^ "South Marston EP through time". A Vision of Britain through Time. University of Portsmouth. Retrieved 11 March 2018. ^ "Book Storage Facility". Bodleian Libraries. Retrieved 2017-09-13.